If you’re not hip to the lingo—and I cannot use that phrase without giggling and picturing Phil from Modern Family insisting that he is, indeed, hip to the lingo, like he knows that WTF means “Why the face?”—you may not be familiar yet with the acronym FOMO. It stands for “Fear Of Missing Out,” and our kids are using it to justify attending events or showing up in various places even if they might not feel like it, because they’re worried that if they don’t, they’ll miss something huge and important. Today’s teens, social media seems to argue, are all about FOMO. They have to go and do because if they don’t, they could end up on the outside looking in. They never want to be the one who wasn’t there, supposedly. FOMO is what social butterflies experience any time they think about skipping an event. 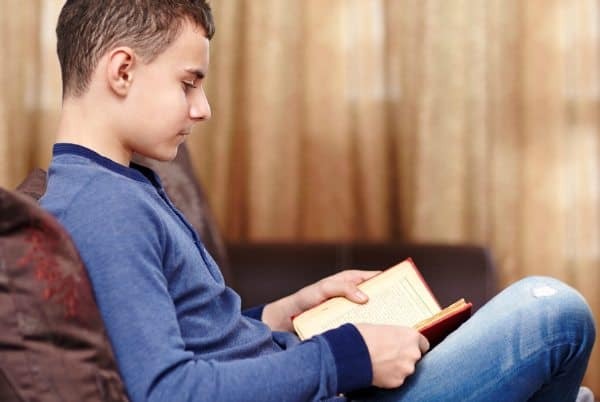 NOMO is what happens any time you suggest to your anxious teen that they consider trying something new instead of sitting at home and reading a book. Both of my teens experience NOMO to varying degrees, for differing reasons, but the outcome is the same: any suggestion of stepping outside their comfort zone is immediately shot down because 1) I’m the one who suggested it, 2) they don’t want to, and 3) if they wanted to, they already would’ve decided to, duh, Mom, get off my back. “I think you’d really enjoy [any school club here],” I say, to my son, every so often. As a parent, I’m stuck between a rock and a hard place when it comes to my kids’ NOMO. I have to somehow assess how much of their resistance is a knee-jerk sort of You’re not the boss of me!, how much is free-floating anxiety, how much is fear of change, and how much is legitimate/mature assessment of the appeal of a given activity. I would love to tell you that I’m the person who knows my kids best and so I can always figure it out, but that would be a lie. It can be hard to know what drives their resistance, sometimes. On top of that, there are times when maybe I agree with their assessment but think they should do it anyway, but they think I’m nuts. And how do I explain, at 44, that I have a perspective brought by time and age, and yes, prom is stupid and you’ll probably hate it, but maybe you should consider going anyway because it’s one of those end-of-high-school landmarks and all your friends will be there? So I flounder a bit, and I bribe a bit, and hedge my bets as best I can. With my son—poster child for the sanctity of routine—anything new is an automatic no. So: Okay, I hear you, you don’t want to. How about you try it for two weeks or two months or a season? If it doesn’t work out, you don’t have to go back. The kid who once told me he had no interest in marching band whatsoever is planning to go out for section leader next year. That was a total win, and I didn’t even say “I told you so” (much). On the other hand, I was sure he would love being part of our school’s Robotics team, and after a month of just not quite clicking, I agreed that he’d made a valid case for not continuing. Now when we run into NOMO, I say, “Remember how I was right about marching band?” and he counters “Remember how I was right about Robotics? ?” This usually leads to me launching into a lecture about how you never know until you try, and you win some and you lose some, and then the next thing I know, he has to wash his non-existent cat again. With my daughter—poster child for looking down her nose at any large-group “purely social” event, and also avoiding anything where failure is an option—I take a slightly gentler approach. What if you go with a friend? What if you plan just to stop by for half an hour? What’s the worst that could happen if you did this thing and you did fail? It’s a delicate balance between honoring her healthy assessment of what she can and cannot handle and also urging her to stretch, a little. Life is not always going to be comfortable and no one wins all the time. Sometimes you have to push yourself and handle what happens next. Exhortations to take some risks now, before she’s an adult and the stakes are higher, fall on deaf ears, mostly. But sometimes they don’t. And I see baby steps toward opening herself up and leaving the safety of what she knows, even if she still insists there’s no way she’s going to prom. Whether they know it or not, both of my teens are constantly doing the hard work of growing into themselves and pushing past their fears. And both of them are turning into incredible, brave human beings. Don’t worry, though—NOMO will forever continue to be alive and well in our house. Especially when I ask someone to empty the dishwasher. There’s a name for it now! This has been driving us batsnot crazy with our boys for awhile now. The homeschooled one AND the middle schooler. They’d rather program at home or make videos at home or…you get it. They need to get out and hang with other kids because 1) they need to and 2) get out of the house I love you but you have GOT to leave me for awhile. It is such a delicate balance, especially with these quirky kids. Yep. So glad to have a name for this phenomenon, and the solidarity comes with knowing that my kid is not the only one out there who is slow to unfold. (If you substitute ‘Creative Writing Club’ for ‘Marching Band,’ and ‘Ski Team’ for ‘Robotics,’ you’ve got the exact script for me and Maggie. Win some, lose some.) Meanwhile, I’ll keep nudging. And enjoying my own flaky snowflake. My poor kid . . . she’s a FOMO girl with a NOMO mom. Maybe they are just introverts? Sometimes it is hard for extroverts to understand that introverts are happy being homebodies!